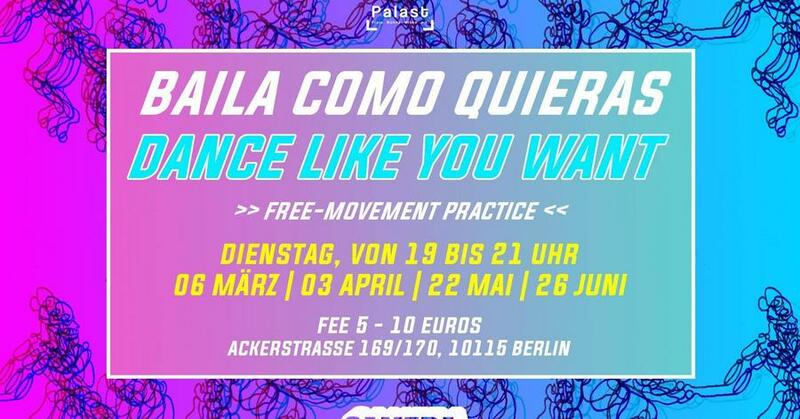 BAILACOMOQUIERAS – 21.05.2019 19:00 @ Acker Stadt Palast | ASK HELMUT – Best time out in Berlin. BAILACOMOQUIERAS/ DANCELIKEYOUWANT It is a free dance practice that invites the audience from all ages to a defined and performative space to share the experience of music and dance. The experience is navigated by consiousness of the body with a focus of finding pleasure in movement. We propose a space in which freedom of movement is a way of relating with ourselves and the community. The project aims to rethink the idea of a party, building a space free from trance facilitating substances (drugs or alcohol) where we can feel comfortable to investigate and connect with the body. We propose dance as a way of liberation and catharsis, a process that develops a kinetic empathy as a strong tool for social transformation. GAMERA COLLECTIVE (2013) We are a multidisciplinary group of artists who work between Santiago, Chile and Berlin. We develop immersive experiences, inviting the audience (in)to define the performative space, being fully part and complicit in the creative process. Our research is based on the interaction and self-organization between people. You. Us. Them. Each other. co-creation, production and technical support from a collaborative perspective.